People say that you have to do what you love to be successful at it. That’s especially true in real estate because it’s a 24-hour, seven-day-a week passion, not a nine-to-five job. In today’s world, everything is about real estate. Owning a home is the heart of the American Dream, and real estate is the financial engine that drives our economy. The challenge in real estate, like it is in life, is not about being good, it’s about going from good to great. That takes not only hard work but personal courage. The greatest piece of wisdom I can impart about being successful is that you can’t be afraid to fail, no matter how big your dreams are, or how insurmountable the obstacles may seem. I would never have been able to put together one of the largest real estate companies in the world if I had been held back by fear of failing. It’s not that I haven’t suffered disappointments, but set-backs aren’t failure. Success is failure inside out. Most importantly, you need a clear and consistent vision of your goals. I never blindly moved from one thing to the next, yet I always left myself open as opportunities presented themselves to get me to where I wanted to go. I was never in a hurry. It’s not realistic to expect instant gratification in a business career. Like Aesop’s tortoise, I knew that steady progress was more important than speed in crossing the finish line. If you asked me what my goal was from the start, I would say it was to build an integrated real estate company where a customer could get expert advice and guidance in every aspect of real estate, from financing, buying, selling, to commercial real estate, and property management. Life is a series of defining moments, not all of them easy. These moments can be daunting, if you let them, or you can use them to help you grow and strengthen your resolve. The moment that most shaped my life happened when I was only ten years old. My mother, father, and my younger sister and brother and I were on our way back from a Vermont skiing trip to our Long Island home when the car skidded off the road and my mother and I were thrown from the car. When I woke up in the hospital I was told by a priest that my father was seriously injured and my mother had died. It was devastating. When a 10-year old girl loses her mother, she changes. I occasionally wonder what my life would have been like if she hadn’t died. Having no one to nurture me, I had to nurture myself and my father and my siblings, who turned to me for love and guidance. I grew up quickly. I understood from an early age that life wasn’t forever and you’ve got to make the best of your time. I resolved that I would make something of myself. I sent myself through college, I got my real estate license, and I went to work for Merrill Lynch, when they had a real estate division. As part of my job, I traveled throughout the country on behalf of the company, learning about the national real estate market, giving me invaluable insight into the business that has served me well to this day. Another defining moment presented itself to me in 1989. Merrill Lynch had sold their real estate division to Prudential, and two years later, Prudential decided it was going to sell off regional holdings, including the Long Island offices. I decided I wanted to buy the entire Long Island division. People said I was crazy. First of all, I had no money to buy it. If I wanted to buy a single office it would have been one thing, but I wanted to buy all of Long Island. I’ll admit it was pretty brazen, but if you want something, you have to ask for it, so I convinced Prudential to loan me the money to buy the Long Island franchise for $9 million. In effect, they had enough faith in me (and my track record) to finance my purchase of their own company. In the early 1990s I bought a house in the Hamptons, a place I loved. It was always my dream to have a weekend place on the East End of Long Island. It’s one of the most exquisite locations in the country, only two hours from Wall Street, and it will never go out of style. It’s also one of the most active real estate markets. In the real estate business, the Hamptons is like Monopoly’s Park Place and Boardwalk combined. Once I owned a home there, how could I not want to open a real estate office? Again, people warned me I would fail trying to expand into the Hamptons because the real estate business was dominated by a group of local real estate companies who were fiercely protective of their turf. But I never focus on my competitors; I focus on my goals and follow my customers. In 2003, I opened the first Hamptons office of my company from scratch, recruiting a local salesforce, and creating a full-service company with offices in every village and hamlet. Within 10 years of hard work and determination, the company became the leader in real estate sales on the entire East End of Long Island. But I wasn’t done. The greatest prize of all was still across the East River. I always knew that one day I would open offices in New York. Long before I opened in the Hamptons, the company’s website said “from Montauk to Manhattan.” The challenge was that Long Island real estate companies were always separate from Manhattan. The East River was supposed to be impassable for a Long Island-based real estate company. Much like the Hamptons, the city had its own entrenched real estate companies, but I contended that if Robert Moses could build bridges and roadways between Long Island and Manhattan, I could bridge the gap with one real estate company. In 2003, in a move that stunned the New York real estate community and made headlines, I purchased one of the oldest and most esteemed companies in the business, Douglas Elliman, for nearly $72 million, with my business partner, Howard Lorber. Douglas Elliman is now the fourth largest real estate company in the United States, with over 6,000 agents and employees, 70 offices, $12 billion dollars a year in sales, and offices in Miami and Palm Beach. Success and the realization of my dreams is thrilling, but the real satisfaction isn’t about how quickly I became successful or how successful I became, it’s about how I got there. Perseverance. The bottom line is, are you better today than you were yesterday? My success is about a series of steps forward, some small, some giant leaps. Real estate is one of the most exciting businesses in the world, tremendously rewarding both emotionally and financially, but it’s also competitive and tough. If you love what you’re doing, the rest is superfluous. Most real estate books fall short. REAL goes beyond mere tactics and strategies to focus on the core of what really matters - You. 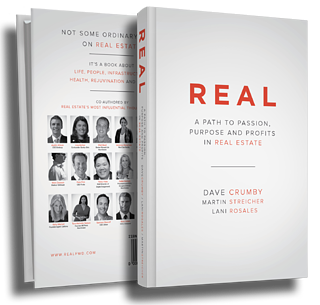 In addition to the authors' lessons learned, this book also includes contributions from some of real estate's most influential thought leaders: Dottie Herman, Marc Davison, Spencer Rascoff, Sherry Chris, Krisstina Wise, and many more. If building a real estate business that lasts is important to you, this is a book you surely won't want to miss!